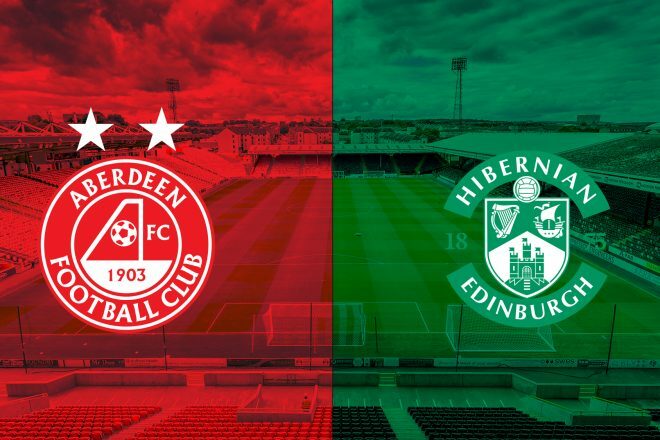 The Dons face Hibernian under the lights as Friday Night Football returns to Pittodrie. 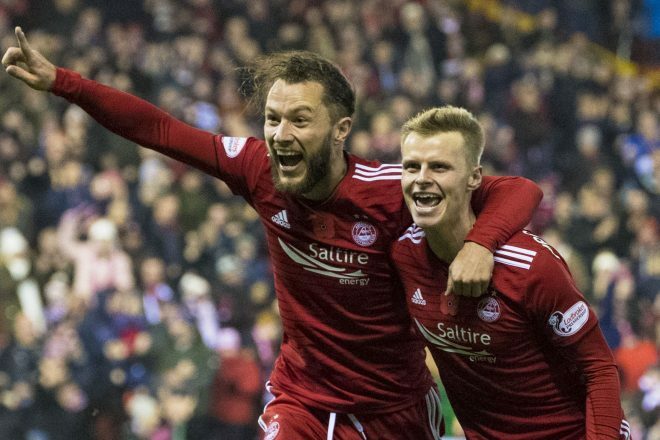 Last week saw Aberdeen make it three wins in seven days as they secured a place in the 2018 Betfred Cup Final by seeing off Rangers at Hampden before beating Hamilton and Kilmarnock in the league. With The Dons trailing with the clock ticking down, Bruce Anderson and Lewis Ferguson turned the game on it’s head and ensured the team left Ayrshire with an unlikely three points. Hibernian are coming off the back of a difficult couple of weeks. Neil Lennon’s side lost at Celtic before drawing the Edinburgh Derby and then went down to St Johnstone at Easter Road on Saturday. Friday’s opponents are locked on 18 points each and the winner could jump up to joint third in the table. On Thursday lunchtime Derek McInnes and Joe Lewis spoke with the media ahead of Friday’s match at Pittodrie. “I’m pleased with the recent results as three wins going into the game helps us. “We’ve a full squad more or less to choose from and we recognise being at home the intention is always to go and try win the game. We also recognise the strength of the Hibs team. They are a very strong side and similar to ourselves this summer have had to make a lot of adjustments, but Neil seems to have a familiarity about his squad. They have a lot of players available that he’s maybe not had. “We’re confident coming off the back of a good week with three great results. The lads are positive, enjoying training and looking forward to the game tomorrow night. Friday will be the 135th league meeting between the sides at Pittodrie and The Dons have the significantly better record than their opponents. There have been 72 Aberdeen victories with the Edinburgh side leaving with the three points on 35 occasions. The points have been shared 27 times. You have to go back six years for a Hibs victory at Pittodrie, with The Dons unbeaten five meetings on home soil. 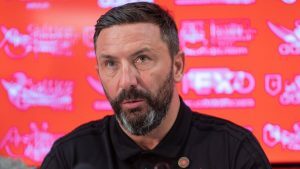 Under Derek McInnes The Dons have only faced Hibs three times in the league at Pittodrie and have earned seven points from nine. Willo Flood’s late long range effort was enough for the win in January 2014 as The Dons strengthened their position at the top end of the table. Hibs would go onto be relegated that season, but returned last year as Championship holders. After Gary Mackay-Steven’s only goal of the game was the difference at Easter Road, the winger was the star of the show when the teams met in the return fixture in December. GMS came up with a fantastic hatrick as The Dons ran riot in a 4-1 win. The last meeting at Pittodrie earned Aberdeen a crucial point in the race for the European spots. 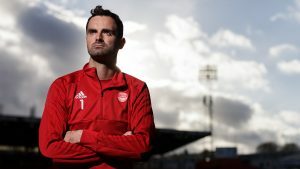 It could have all been so different if Joe Lewis hadn’t saved Jamie Maclaren’s penalty and the teams settled for a goalless draw. The Dons would go onto finish runners up and Hibs finished fourth, gaining the final European slot available. At Easter Road in August, Tommie Hoban’s first goal for the club looked to have secured a big win, but Hibs drew level late on. The teams couldn’t be separated again a month later as a fantastic Betfred Cup Quarter-Final went all the way to penalties. Fortunately, The Dons got the job done as Thomas Agyepong cracked the crossbar to send the visitors into the last four. The 06/07 season was the most impressive league campaign under Jimmy Calderwood’s stewardship at Pittodrie with the club securing a return to European football at the end of the season. One crucial victory that year came at the end of October when Hibs visited on a Monday night. Chris Killen had the visitors ahead just after the break, but The Dons were able to get back level when Lee Miller turned from close range and fired in his first goal for Aberdeen. The Dons pressed for a late winner and they got it in the 93rd minute when Scott Severin brought the ball down in the Hibs half, composed himself before unleashing an unstoppable effort from 25 yards to win it. The club would finish four points ahead of Hearts and late winners such as “Seve’s” that night went a long way to snatching that European berth. If you can’t make the match, then make sure to tune into RedTV from 7.30pm with special guest Stuart Duff. International subscribers will have live video and post-match we will bring highlights, goals, reaction and a full match replay. Enjoy the game and COYR! 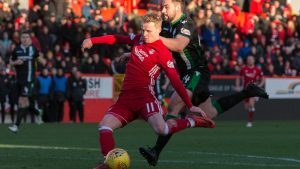 A superb first half strike from Gary Mackay-Steven combined with a combative display from his teammates sealed a fourth consecutive victory for The Dons in difficult conditions at Pittodrie. In the 11th minute Aberdeen conceded a cheap corner when a misplaced backpass ran beyond Lewis. The Dons cleared the corner but gave a free-kick away on the edge of the area which looked like it would cause danger but Mallan’s effort ended up comfortably over the bar. Both teams seemed to be struggling to adapt to the conditions, winter had well and truly arrived. When The Dons did get the ball down and over to Mackay-Steven he skipped past Porteous and was brought down as he looked to have broke free of the defence. The challenge earned the youngster a yellow card. From the free-kick Bogdan did well to tip McGinn’s cross clear. The Dons were boosted by the goal and finished the half strongly with Hibs having a wobble after going behind. Mackay-Steven’s confidence looked to be rubbing off on those around them with his teammates surging forward and the half-time whistle came at a good time for the visitors. The first goalmouth action of the second half came when a Hibernian corner was delivered to the near post, May’s clearance was sliced and Logan had to be there to clear again after being in the right place at the right time on a couple of occasions in the first half. Up the other end Slivka curled a ball low to the near post for Kamberi who got across Devlin, his flick was turned wide by Devlin who didn’t know too much about it.